I’ve been very busy lately doing photo shoots of local Central Illinois artists, performers and entertainers for the Playing Peoria website that I’m producing in association with ArtsPartners of Central Illinois. I completely enjoy every shoot, but some are more interesting than others. 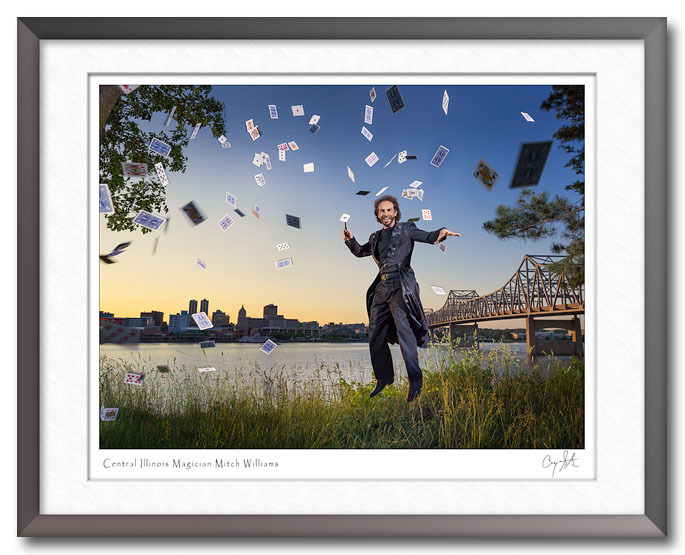 And, the photo shoot of magician Mitch Williams was certainly interesting! I like to approach the photos as a collaborative process, so Mitch and I had talked through a variety of ideas. The one that seemed to keep coming to the top of the list was of him spearing the ace of spades from a flurry of flying cards. And, we might as well make it more interesting by having him appear to float above the ground with the Peoria skyline in the background. Lastly, I didn’t want to use a lot of Photoshop “magic” to make the photo, so we mostly relied on good old-fashioned production processes, and a couple of helpers. The setup was pretty simple. My helpers (wife Deb and grandson Chase) and Mitch all tossed their cards into the air. Then, Mitch jumped at just the right moment as the cards are flying past and I try to get the shot as it’s happening. The short video clip below shows how it looked. Timing, of course, was critical, and we had to do numerous takes to get the right combination. Then, we’d all join in a game of “52 Pickup” and repeat the process. In the end, we had just a couple of frames that had a good combination of Mitch in the air without any cards covering his face, and this one in particular stood out as the best. Photographically, the setup was pretty simple as well. The camera is on a tripod at the far right of the video frame. Mitch is mostly shaded by some trees along the river, so I’m free to light him with a couple of strobes. (My preference is to let nature light the background while I light the subject.) You can see the main strobe high in the air between Chase and the camera. The second, accent strobe is positioned right next to the video camera and has an orange gel to mimic the color of the light of the setting sun. Post-production in Photoshop was pretty basic. Besides adjusting tones and colors, I removed the small stool and added a few more cards from two other frames to create the final image. Of course, I can’t tell you the secret of how Mitch managed to end every take with the ace of spades magically impaled on his dagger. This entry was posted in Photography Techniques, Playing Peoria, Recent Work. Bookmark the permalink.